EZRentOut also integrates with your LDAP (Lightweight Directory Access Protocol) or Active Directory servers. Customers in your organization can use their LDAP credentials to access EZRentOut. Enable LDAP Server Integration from Settings → Add Ons. Note: In EZRentOut, LDAP Integration only allows your customers to access your EZRentOut account. Why integrate your Active Directory with EZRentOut? What information is synced when LDAP sync takes place? LDAP or Active Directory Domain Services (AD DS) stores directory data and manages communication between customers and domains, including customer logon processes, authentication, and directory searches. An LDAP directory is organized in a simple “tree” hierarchy. LDAP is most commonly used in medium to large companies. Some of our subscribers wanted to ‘sync’ their customers’ database with EZRentOut or wanted to avoid replicating LDAP customers in EZRentOut. For such cases, we allow an integration with LDAP servers. – LDAP Server Port: The port on which your directory server listens to requests. – LDAP Admin Login: This should be the complete ‘dn’ (domain component) of the admin user on your company’s directory server who is able to search through all of your directory users i.e. customers. – LDAP Admin Password: Password of the admin user on your directory server. – LDAP Login Attribute: The attribute that your customers will use to login to their account. The default value is ‘cn’ (common name) but you can change it to any attribute e.g. ‘mail’. – LDAP Encryption Enabled: Select this setting only if your directory server allows secure connections. Once you’ve filled all the above settings, click ‘Verify Connection’ to ensure successful integration. Identify the organizational unit (one or more) where your EZRentOut customers exist. All customers in that organizational unit(s) will have access to EZRentOut, and any customer outside the given organizational unit(s) won’t be able to log in. If you have a nested OU structure (e.g. For example if you’re a university and you’re renting out equipment to students or faculty members. In this case, School of Business Management is an OU, which has two sub-OUs School of Marketing and School of Finance) then all the sub-OUs also need to be listed. In this example, we’ll list 3 OUs; School of Business Management, Marketing, and Finance. Save the above settings by hitting the ‘Update’ button at the bottom of the ‘Add Ons’ page. Once your LDAP settings are in place, you can import the customers from your AD using the ‘Sync with LDAP’ button at Customers tab. 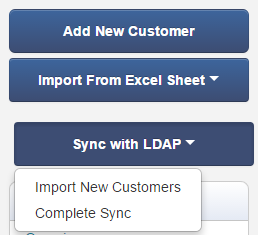 You can also sync (update) the EZRentOut customers with your LDAP customers, using the ‘Complete Sync’ option. The sync process can be automated by enabling the ‘auto syncing of customers’ setting at Settings → Add Ons → LDAP Server Integration. Note: A common issue for an unsuccessful import/sync process is not having Last Name and Email attributes configured in your LDAP server. Also look out for invalid customers’ email addresses. Settings → Add Ons → LDAP Server Integration has 4 advanced options. 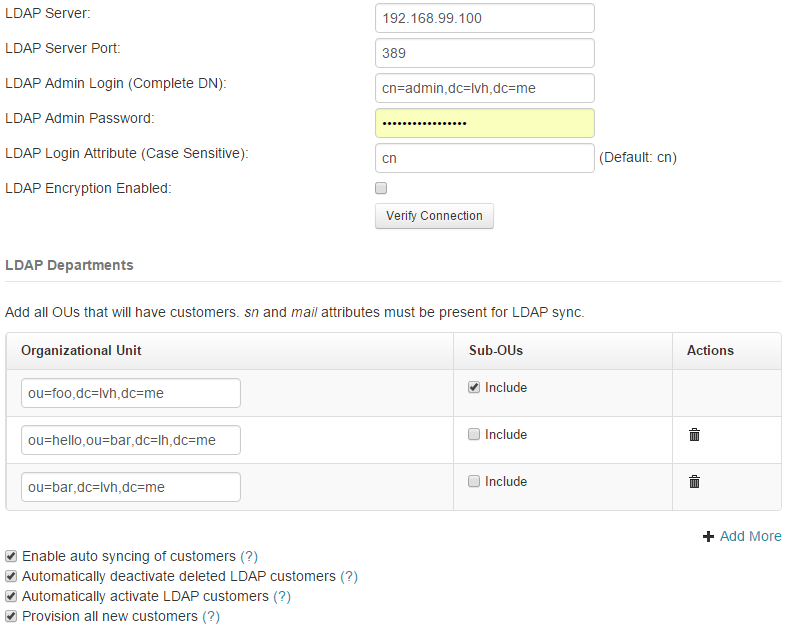 a) Enable auto syncing of customers: Check this option to automate sync of EZRentOut customers with LDAP customers. This sync occurs once every day. b) Automatically deactivate deleted LDAP customers: If selected, the suspended customers in LDAP are automatically disabled in EZRentOut. This ensures that EZRentOut access will automatically be revoked for the customers you’ve suspended in LDAP. c) Automatically activate LDAP customers: If some inactive EZRentOut customers are found in LDAP server, they will be reactivated on the sync. d) Provision all new customers: If selected, customers from your LDAP (selected OUs) will be automatically imported, if they aren’t present in your EZRentOut customers’ list. Only three fields are synced – First Name, Last Name, and the email. If you don’t import or sync customers as detailed above, they’ll be created in EZRentOut and synced as they access the account. 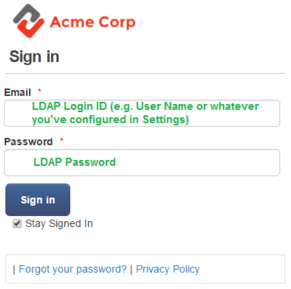 Your customers can use their LDAP Credentials on your Log In screen. If you’d like to remove the ‘Login with Google’ and ‘Login with Windows’ options, you can do so from Settings → Company Settings → Authentication. Note: The customers need to login at least once after the LDAP Integration to show up in your EZRentOut account, provided they are not synced. For more assistance, drop us an email at info@ezrentout.com. You can also share your ideas on our Community Forum. Visit our blog for more support posts. This entry was posted in [Support], Feature, Integration, productivity and tagged customers, ldap, ldap integration by admin. Bookmark the permalink.